After 70 years of serving as the regulatory body for California lawyers, the future of the unified State Bar is in the hands of the same body that created it in 1927  the state legislature. At least three separate funding bills were expected to be introduced when lawmakers reconvened Jan. 5. Although most observers believe that the existence of a State Bar is certain, it appeared likely that the bar will split into mandatory and voluntary components. I think there is going to be a voluntary arm of the bar, said bar President Marc Adelman following a mid-December meeting in Sacramento with legislators, representatives of the governor and other parties. Urgency legislation to restore the bars funding was expected to be introduced into the legislature earlier this month, authored by Assemblyman Robert Hertzberg, D-Van Nuys. At least two other bills dealing with the structure of the bar were also expected by longtime bar critics, Sen. Quentin Kopp, I-San Francisco, and Sen. Bill Morrow, R-Oceanside. 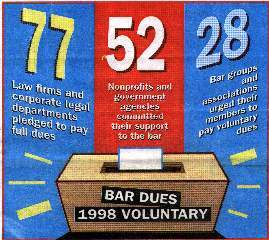 Seventy-seven California law firms and corporate legal departments had committed to pay their lawyers State Bar dues voluntarily by mid-December. The amount includes a $77 mandatory fee and an additional $381 authorized in the fee bill vetoed by Gov. Wilson in October. Under that bill, active attorneys in California with more than five years of experience would have been required to pay $458 in annual bar dues. 52 nonprofit providers and public agencies also have agreed to pay the full $458 fee voluntarily for their attorney employees. Following the veto, the board of governors began to solicit voluntary payment of bar dues. Fee bills were sent to members in November. Although the future of the State Bars minimum continuing legal education (MCLE) program is uncertain, the 44,000 active attorneys in compliance group one are being asked to submit a compliance card. At its regular meeting last month, the bars board of governors decided to ask attorneys whose last names begin with the letters A - G to attest to completion of 36 hours of MCLE courses. At the same time, however, the board agreed not to assess the usual $75 late charge if lawyers do not show their compliance. Briefing in the case (Warden v. State Bar of California) was completed in November, but oral argument before the Supreme Court is not yet scheduled. Once arguments are heard, the court must rule within 90 days.